In an uncharacteristic moment of gratitude, I want to say that I am really thankful for the growing network of parents of young kids in my small historic town of St. George’s and it makes me happy that Eva will have nice friends to grow up with, and it makes me even happier that I won’t have to trek up to Warwick parish for a play date and back. Hurrah! 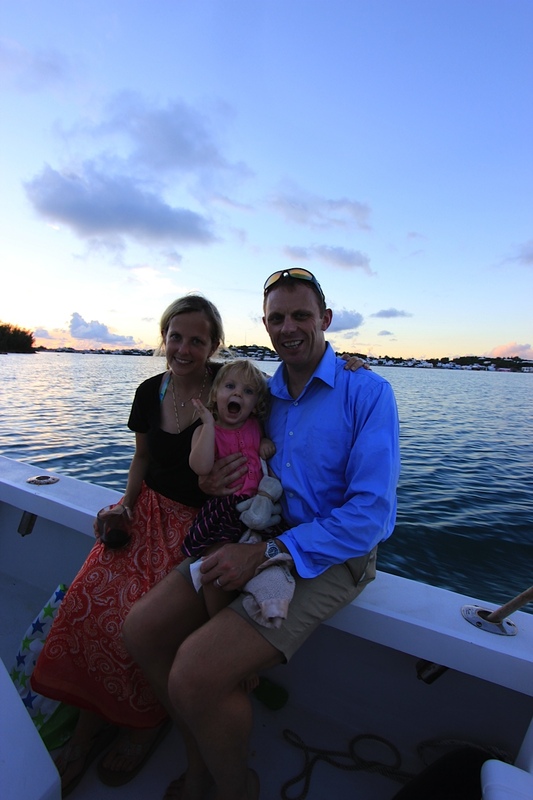 Two weeks ago, a new friend and our neighbors invited us out for a cocktail cruise on Friday evening with the kids. I couldn’t wait, so I rushed home with Eva and got her prepared for the occasion. I had RSVPed for Chris saying that he would probably not get home from work on time, because Fridays are always his busiest day when he has to close off but the press continues to print over the weekend. He said he would call me when he got home and maybe the boat could swing back and pick him up if he wasn’t too late. The boat slipped into our dock at 6pm sharp, and as I am always running late perpetually, Eva and I were the last ones onboard around 6:30pm. Chris was nowhere in sight, he had as expected missed the boat. The plan was to pick up pizzas at the Wharf Tavern for the kids, so the boat motored into the dock of our local pub and restaurant a little later than planned. Sarah hopped out to pick up the pizzas, leaving us on the boat. When she came back, she came back with pizzas and a huge surprise for me. There standing on the dock in his Bermuda shorts and work blazer was Chris. I was stupefied. Chris was stupefied. “What are you doing here?” I said as my mind began to whir. “What are you doing here?” he said buying time. “We picked up pizzas, that was always the plan.” I say stating the obvious. I look over at Sarah who is holding the pizza, standing a few feet away looking as if she had grabbed him by the ear like a naughty school boy and dragged him off the bar stool to have a very public scolding by his wife. “What are you doing here?” I ask again. “Really?” I said still confused. “You do I guess.” I say answering my own question. Everyone chimed in, insisting that he board the boat immediately. He tried to hesitate and I gave him a glare. So he went back, poured his pint of beer into a plastic cup and boarded the vessel. After first being really annoyed I realized that he never gets to have five minutes alone ever to be his own person, not someone’s boss, not someone’s employee, not someone’s wife, not Eva’s father, not Daddy monster, or Eva’s horsie, or Daddy shark. Sometimes, even Super Daddy needs a break, even if it is a stolen few minutes over a pint of beer with Gunter of all people! “You can check if you want, but I am not lying,” says the mother to the child. She toddled into our bedroom and looked high and low for him. It was the moment when she accused me of hiding her Daddy as if he was a stuffed toy, that I realized it could be worse, Sarah could have caught him in a Hawaiian shirt, with a suitcase, and a travel itinerary. And if Chris wants to sneak around behind my back with Gunter- of all people, it is okay by me. 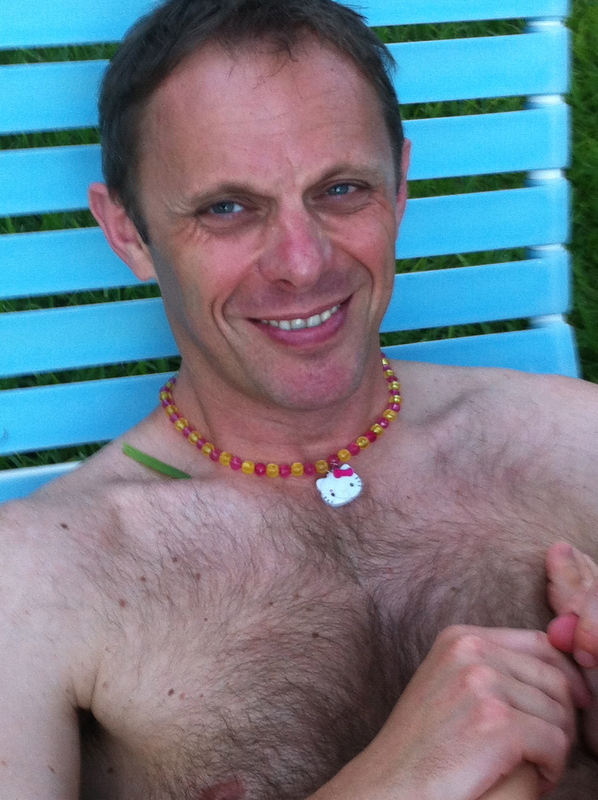 But I have one condition, and that is that he continues to be Daddy Monster, continues to model Eva’s Hello Kitty Jewelry line and give up all his beer cozies for her bottles. I think that is an agreement we can broker and anyway Eva loves you more than me, or so she says. Sarah took a picture of us on the boat cruise to immortalize the evening. This entry was posted in Chapter 9 - Month 9, Uncategorized and tagged beer, busted, Funny mom blog, Mom Funny by derelictmom. Bookmark the permalink. Very funny. Great writing. I feel for you Chris. 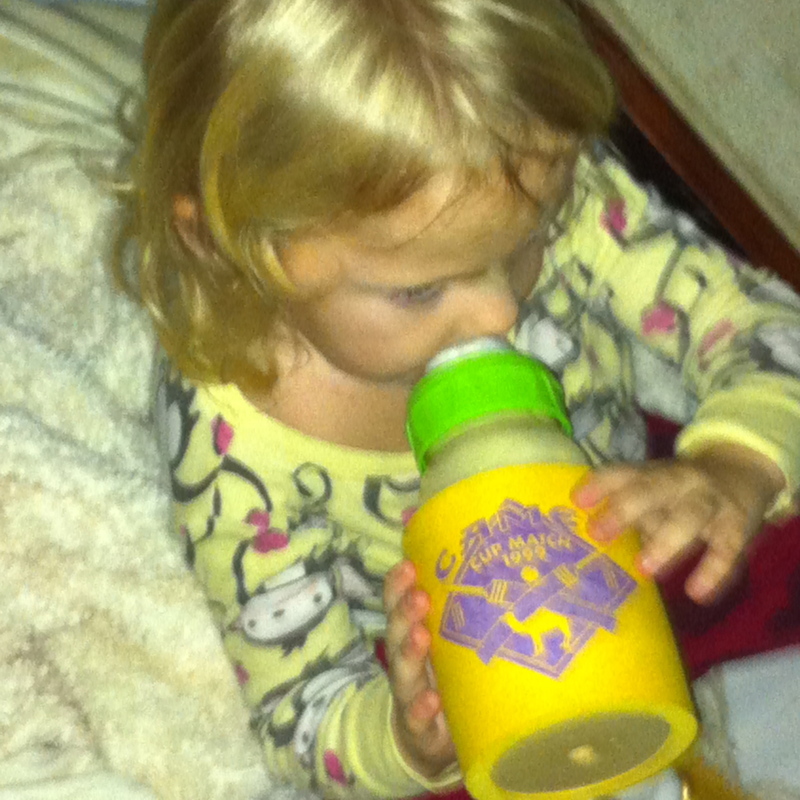 LOVE that Eva has re appropriated Chris’ beer cozies.